I can think of few characters created in the last decade so instantly and irresistibly appealing as Antonio Banderas’ Puss in Boots. The only other one that comes to mind is Johnny Depp’s Captain Jack Sparrow; both came completely out of left field, stunning audiences and immediately earning iconic status. Much of what makes both characters so exciting is the performance, the unwavering devotion and expertise the actors bring to otherwise pedestrian roles. But where Sparrow is defined by his unorthodox physicality, Puss is an entirely vocal creation: great as the animation may be, the design is clearly guided by Banderas’ outstanding voice work. In total command of every last syllable, Banderas and his rich Spanish accent can tell us everything we need to know about Puss with little more than a short phrase. Puss is confident, keen, smart, talented, and dangerous, a ladies’ man with an eye for fashion. We knew this the moment he appeared in “Shrek 2,” and just as Jack Sparrow’s popularity endures to this day, the novelty of this swashbuckling feline has never worn off. The advertising for “Puss in Boots” boiled this all down into one simple fact: Puss is awesome, and boy did DreamWorks pimp the hell out of that awesomeness with a barrage of teasers playing off of Puss’ inherent likability. These ads got me excited. Thanks to “Shrek” 3 and 4, it’s been a long time since Puss was in a movie that wasn’t god-awful, and more-importantly, in a film that played to his strengths. The advertising showcased an adventure built entirely around what makes Puss lovable, and while I’m typically wary of spin-offs, Puss is clearly a character capable of headlining his own film. 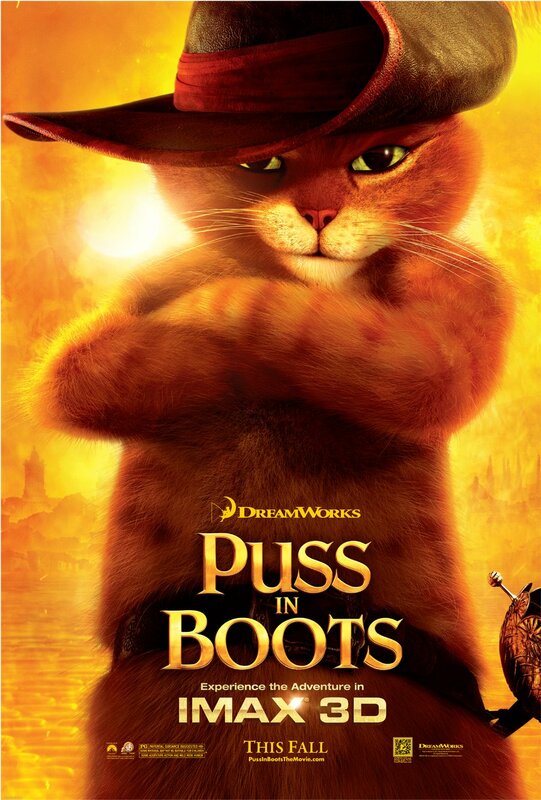 Trust DreamWorks, then, to mislead us all the way into the theatre, because much of “Puss in Boots” squanders this great character in favor of a needlessly convoluted and clichéd story. The film finds Puss on an quest for the three magic beans of legend; along with an old friend, Humpty Dumpty (Zach Galifianakis), and a mysterious new ally, Kitty Softpaws (Salma Hayek), Puss hopes to produce the mythical beanstalk, climb to the heavens, and find the goose that lays the golden eggs. On paper, that’s not a terrible idea for a movie. Like the original “Shrek,” it’s a clever twist on fairy tale tropes, and the danger of the quest is well suited for a swashbuckler like Puss. In execution, though, the story is just a thin front for an awful lot of tedious exposition. Humpty and Puss were friends raised in an orphanage, you see, brothers devoted to finding the magic beans until Humpty and his greed betrayed Puss. Their relationship is the crux of the film, but I question the need for Puss to have a detailed backstory. The mystery of the character is part of the fun; like many of the great Western heroes he is modeled after, Puss is a hero without a past or a future. He exists perpetually in the present, and though revealing his origin showcases a dazzlingly adorable kitty-Puss, it also takes away the enigmatic edge the character needs to thrive. More importantly, Humpty Dumpty is an abomination of a character, and his role in the narrative is so crucial that he brings the film down with him. Humpty’s design is downright creepy and unappealing, and though Zach Galifianakis is a talented live-action comedian, he isn’t good at voice work, failing to give the character a distinct or endearing personality. There’s a disconnect between Humpty’s voice and physical presence that is constantly distracting, and the script does him no favors. Humpty’s anti-hero arc isn’t anything new or original, and he speaks exclusively in poorly-written clichés that quickly become tiresome. The film tries to find an emotional center by putting Puss and Humpty’s troubled bro-mance at the heart of things, but thanks to Humpty, the effort hurts the movie rather than helping it. Exposition about their relationship and forced emotional moments rob Puss of so many chances to be a badass that when Puss’ name becomes ‘legend’ at the end of the film, we have to wonder what all the fuss is about. Humpty dominates far too much of the movie, but when he’s not on screen, or at least marginalized in the background, the film is a rousing success. There are numerous moments or sequences where the full, shining brilliance of Puss is on display, moments of such inspired (and hilarious) originality that it’s easy to overlook many of the film’s failures. The first fifteen minutes and the last five, in particular, are a wonderful showcase for the character, plunging Puss into a delightfully fitting South American setting that lets his personality shine. Scenes shared with Kitty Softpaws are equally thrilling; Salma Hayek is a perfect counterpoint to Banderas, and in what must be a first in the history of animation, they manage to create smoldering, palpable sexuality between two CGI felines. Visually, “Puss in Boots” is a remarkable triumph, the most cinematic, finely crafted film DreamWorks animation has ever released. Director Chris Miller fills his wide anamorphic frame with vast, open vistas and rich, detailed set pieces; there are moments of such incredible visual ingenuity that they alone justify the ticket price, and I’ve never seen 3D implemented so expertly in an animated film. Miller knows exactly how to use depth to his advantage, and the effect works so well that I simply can’t imagine the film in 2D. At its best, “Puss in Boots” sports a wholly original and unique tone we haven’t seen in animation before. Much of the film falls flat, but when the visuals, Latin-flavored music, Spanish-Western setting, and Puss’ own irresistible nature come together in perfect harmony, the result is something truly special. It’s unable to sustain that wonderful tone with any amount of consistency, but there’s enough here worth recommending, and as kids entertainment goes, you could do a whole lot worse. to support future reviews on www.jonathanlack.com. The character may be here to save the day, but the movie's only here to pass the time and it does that just fine. Nice review. Check out mine when you get the chance.